Tamworth-based Shire Leasing is to be the official Show Partner of the 2018 Made in the Midlands Exhibition. The exhibition, which takes place at Coventry’s Ricoh Arena on Thursday (June 21), is the ninth annual exhibition showcase for Midlands manufacturing and this year is the biggest ever Made in the Midlands event with more than 200 exhibitors, plus the Bloodhound SSC car. Supporting SME manufacturing companies, Shire Leasing was formed in 1990 as an innovative and agile company working with manufacturers, resellers and distributors - offering today a world class service in assisting SME firms in their growth. As a British Business Bank partner, Shire Leasing are committed to supporting British businesses and have helped more than 60,000 customers over their 27 years of operation. As a B2B funder with an Own Book exceeding £100m, Shire Leasing specialise in asset based finance, ranging from traditional finance leases and hire purchase through to loans and seasonal leases. Their Midlands-based account managers will be present on the day of the exhibition on Stand 90 to raise awareness of and discuss their wide range of alternative finance solutions to support business growth plans - where traditional sources such as mainstream banks may not always be the most effective or available choice. 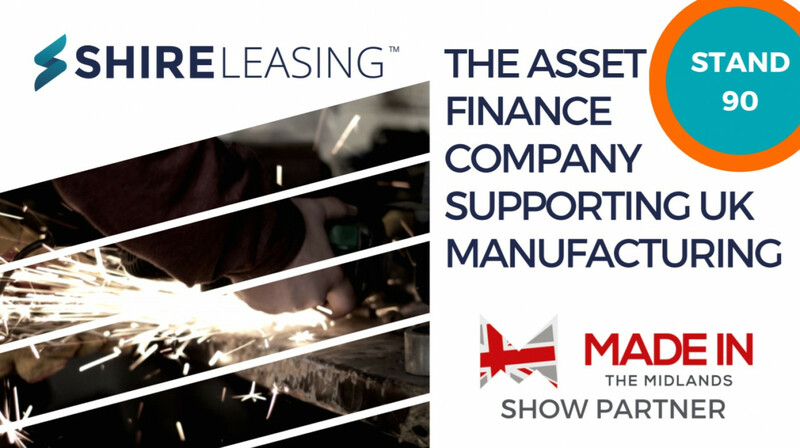 As well as informative chats and information on how they can tailor finance packages to suit businesses in the manufacturing sector, the Shire Leasing team will also be able to offer indicative pricing and quotes at the stand for equipment or machinery that visitors may be considering purchasing in the future, or even viewed from one of the MIM partners at the exhibition on the day! Visitors are encouraged to have a no-obligation chat to discuss their growth plans and finance options, get quotes for their upcoming equipment/machinery requirements and of course to get their hands on some freebies (while they last)! Leasing and finance options allow SMEs to invest in assets or equipment for growth more affordably, by alleviating cash flow and spreading costs. Employing over 150 staff, Shire Leasing already supports over 66,000 SMEs across the UK and has been a partner of the British Business Bank since 2014, where investment helped bolster their Own Book funding facility. MIM CEO Jason Pitt said: "We are very excited to be working with the Shire Leasing team - our members are growing and need choice in the best way to fund their growth, traditional lending methods have come under pressure with the way banks have changed their funding criteria and this partnership helps Made in the Midlands pull off its biggest ever exhibition, whilst giving our members and visitors much needed information on ways to fund their growth." Charles Addison, Director of Made in the Midlands, added: "Our £120bn manufacturing network is growing very quickly and requires an agile and effective partner to help assist firms make the best choice on how they support growth and considering the needs of manufacturing businesses in this region from communication, telecoms, security, fleet vehicles, IT and much more and Shire Leasing are a well-established and reputable partner to help Made in the Midlands members."